What is a Geri Chair? A geriatric chairs or recliner, often called a "geri chair," is a reclining chair with wheels that make the chair navigable by a caregiver. They are not self-propelled, meaning the chair/recliner must be pushed by someone else. Geri chair recliners are made to be comfortable, functional, easily cleaned, and usually have a high back, a foot ledge/rest, and either a removable activity tray that inserts from the front of the chair, or a "wing" tray that conveniently folds down one or both sides of the chair. Some geri chair recliners even feature "drop arm" or "swing-away arms" to make entering and exiting the chair with the assistance of a caregiver much easier for users with mobility challenges. 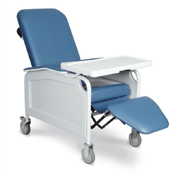 Geri chairs are frequently used in both home and hospital or facility settings. Whether used in a home or in a facility, these patient recliners are ideal for a wide variety of activities, including eating, reading, writing, arts & crafts, watching television, and even sleeping. 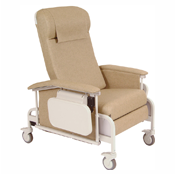 When used as a hospital chair or as patient room chair, both patients and overnight guest visitors have been known to sleep in them with great comfort. Many people want to purchase a geri chair for use in their home after a hospital stay where they found the chair to be so comfortable and convenient. 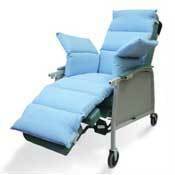 What is the difference between a "Home Care and Longterm Chair" compared to a "Clinical and Infusion Chair"? That is an excellent question, and the one asked most frequently by NewLeaf shoppers. Home Care and Longterm Chairs are typically used in residential, assisted living or longterm care facility environments. While Clinical and Infusion Chairs can be used at home, their design and functionality are made especially for clinical environments. 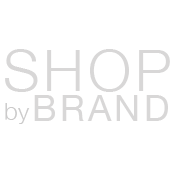 We recommend that you consult the convenient "Functionality" details listed on each recliner's product page to make sure that the model fits your unique needs. The number of Positions (3-Position reclining, Infinite, or Trendelenburg), Occupant and Caregiver Controls, and Table Configuration are likely to be very important in making your decision. Additionally, consider the recliner's Casters. For example, Four Swivel Caster (360 degrees rotation) models are the easiest to maneuver in confined spaces. Models with Fixed Casters (point in one direction) on either the front or back (with Swivel Casters on the opposite side) require the caregiver to maneuver the chair forward and backward to precisely turn in confined space.